Nokia 8 is coming soon, and we all know that by now but after the launch of its first premium high-end smartphone, Nokia is launching an ultra-affordable phone named Nokia 2. Just a couple of days back, we got the alleged drawing that revealed the design of the device from the rear as well as from the front. One of the notable differences between Nokia 3 and 2 is the build material and the buttons on the front. Nokia 3 has capacitive touch buttons where the Nokia 2 features on-screen buttons. Today, an unknown Nokia smartphone was spotted on Geekbench. We have seen that every Nokia phone that got listed on Geekbench had the name ‘heart’ and same is the case today. 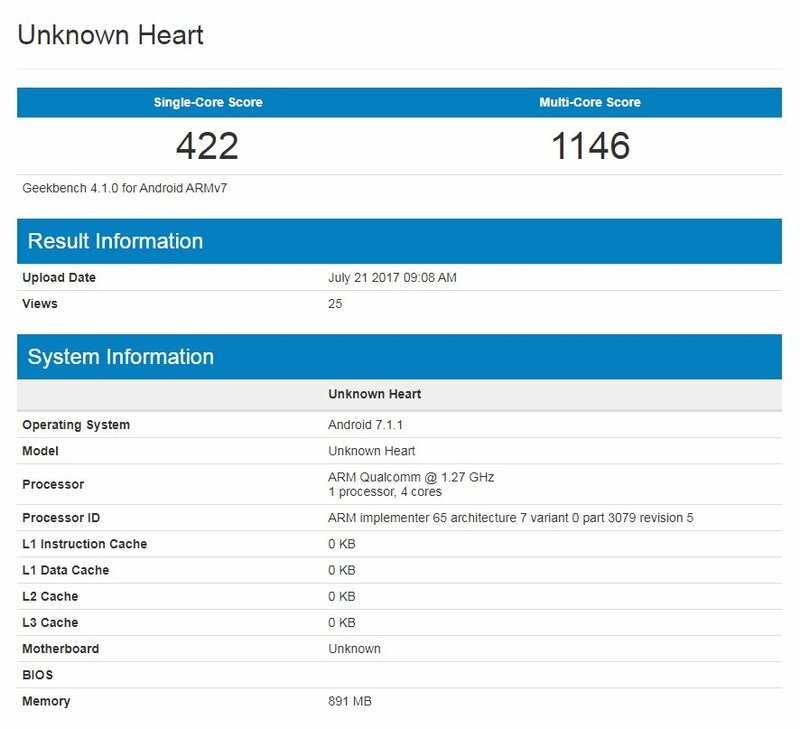 The phone with the name ‘Unknown Heart’ has been spotted on Geekbench and looking at the processor and amount of RAM; we can say that this is the Nokia 2. Geekbench listing mentioned that it features a Quad-Core 1.27GHz Qualcomm Snapdragon 212 processor along with 1GB of RAM. This means the phone will surely cost under $100. The Qualcomm Snapdragon 212 processor is an upgrade to the Snapdragon 210, and it brings features like faster CPU and support for 1080p Full HD video playback. It also has X5 LTE for advanced 4G LTE features in high-volume smartphones. Lastly, the phone runs on Android 7.1.1 Nougat out of the box. Let’s see what is going to be the price of Nokia 2. We hope that Nokia keeps it as low as possible for a phone with such specifications. Then, it might be a good competitor for Moto C.